Free Standing Parking Assist Device - Moar Stuff - You don't need it but you know you want it. (Set of 2) Smart Parking LED Garage Flashing Warning Stop Sign - Bumper Sensor. LEDs will automatically flash if your vehicle's bumper taps the pole. Height adjustable up to 4 feet, and weighted non-slip base for extra stability. Each sign comes with base, poles, connectors, and 2 button cell batteries. Let’s face it, a lot of us use the garage less for storing our cars, and more for storing our crap. Well, this Free Standing Parking Assist Device is perfect for those of us who have very nearly as much stuff as space in the garage. 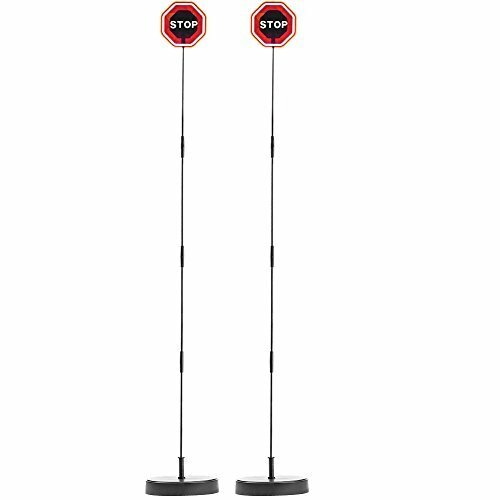 Basically, it’s a small stop sign on a 4 foot, lightweight pole. You place it in your garage where the bumper sits when the car is where it”s supposed to be. When you pull into the garage and tap the sign, it will start flashing its built-in red LEDs to let you know to not pull in any more. It’s easy to see at night and is much better than those fancy ultra sonic bumper detectors because you can set it in front of your stuff. Other sensors usually have to be mounted on a wall or ceiling to function. That means you have to totally remount it if you get a new car or switch parking spaces. With this simple Free Standing Parking Assist Device, all you have to do is move it over a bit. Oh, and since most families have more than one car, you get two in a package. It comes down to these three choices; you can either buy this, risk crashing into something every time you park in your garage, or actually clean out your crap so you have plenty of space to park. We all know you’re not going to clean out your garage so, I hope you either buy this or don’t run over something that’s too expensive. Dimensions: 9.8 x 8.8 x 5 inches (in the box). Height adjustable up to 4 feet, and weighted non-slip base for extra stability so it can be placed anywhere. No more knocking over your bicycle while trying to fit into the garage. It’s either get this or actually clean out your garage.